This year, Nick has become somewhat of a gourmet – while he was doing INDT last year, a staple on his list were items from the 7×7 Magazine’s Big Eats list, but this year for INDT he took advantage of the fact that neither of us had been to several fine and sometimes famous restaurants. During those gastronomical adventures, Nick’s hunger (ha ha, pun intended) for learning more about the culinary arts grew, and several great cookbooks were added to our collection. Last year, we purchased a new grill, which we’ve used for several INDTs, and this year, though I had some new cooking experiments in mind, several have come about because of Nick’s excitement to explore more ingredients, techniques, and equipment. Tonight’s is one of those. 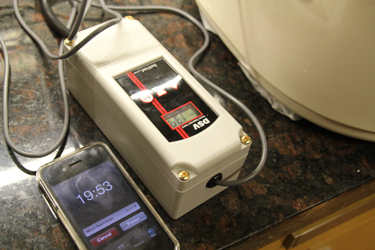 For his early Christmas gift, we bought a Sous Vide Temperature Controller. Basically, this is a power plug controlled by a thermometer. 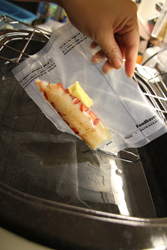 “Sous Vide” translated from French is “Under Vacuum” – to cook “sous vide” is basically to put the food to be cooked in a vacuum sealed bag, and to submerse it in water that has been heated to and kept at a certain temperature for the length of the cooking time. The result is that everything in that bag is cooked to the same doneness throughout the entire mass. For example, if you’ve ever cooked a thick piece of meat – a roast, for example, there are always parts that are more “done” than others. The thicker the item, the more time it needs to cook through to the middle, which means the outside parts are going to be more cooked than the inside. While this is totally fine for a lot of applications, there are some items that you really don’t want to be a varying degrees of doneness. 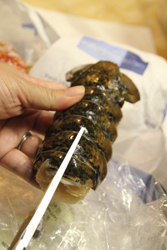 Take lobster, for example (or most any other seafood) – the meat is so delicate that you can’t afford to have parts that have been done and still cooking, for another five minutes even, while you wait for the center to be finished. 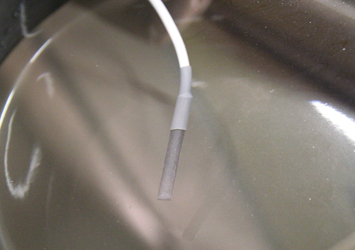 While cooking things at a lower temperature for a longer amount of time can be the fix in some cases, in others that just results in rubbery food. This is not just the case with meat, either. Any thick piece of food you want to cook is the same way – this is one of the reason we cut vegetables up before cooking them, so they’ll cook more uniformly – who wants potatoes that are mushy or burnt on the outside and raw on the inside? 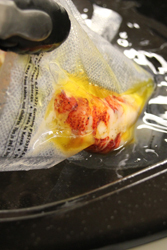 There are other uses for the sous vide technique as well, which is why we used this method tonight. Poaching is a way of cooking by in essence putting your item in a hot bath, and letting the temperature of the cooking liquid slowly cook the food, imparting it with the flavor of the liquid its being cooked in. This is a fantastic way to cook a whole chicken, but what about that seafood I mentioned earlier? 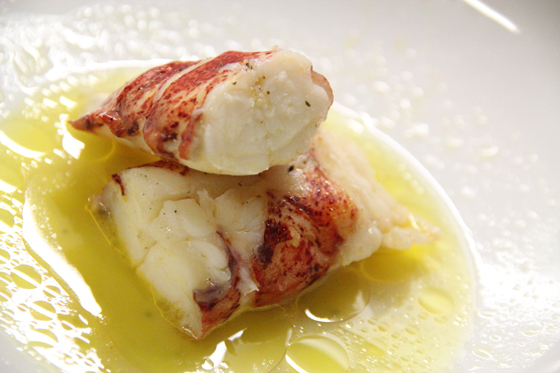 To make his butter poached lobster, master chef Thomas Keller used to use almost a full pound of butter to cook about three pounds of lobster meat – and he still had to work in batches – watching the temperature closely, regulating the heat. If the lobster gets overcooked, that’s a lot of money and time wasted. 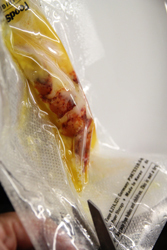 Chef Keller switched his butter poached lobster to a sous vide cooking method a while ago, and has never looked back (he even wrote a sous vide cookbook that we want to get, too). 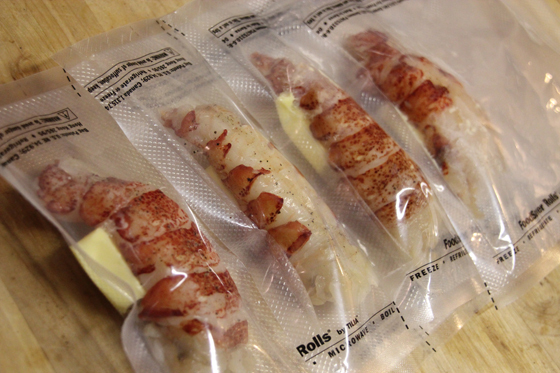 Tonight, Nick let me christen his sous vide temperature controller, and I made Butter Poached Lobster, sous vide style. We followed this recipe from the Sous Vide Supreme website as far as ingredients, trying to be as simple as possible. 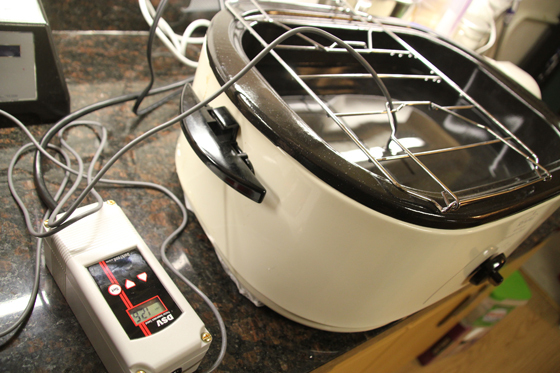 First, we set up our homemade sous vide hack by filling our crockpot with hot water (another vessel that was suggested was a rice cooker – basically anything that can hold a decent amount of water and is used for cooking, with an electric plug). You’re supposed to plug the pot into the temperature controller, and then the controller into the wall. 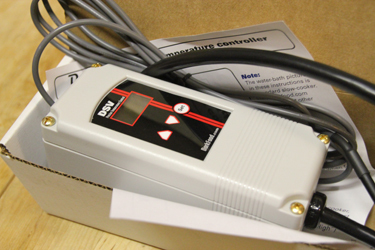 When the temperature gets to a certain high point, the controller cuts the power to the cooking appliance – when the temperature drops to a certain low point, the controller powers the appliance again. We put the thermometer into the water, being sure it was submerged, but didn’t touch the sides or the bottom, and set a temperature on the controller. The crockpot heated the water to the temperature we had set, and then the controller cut power, and the crockpot turned off. Cool. But then when we heard the controller kick over to start power again, we realized the crockpot didn’t turn back on. Boo! We were afraid of this. Our crockpot was too smart! It had a safety feature that didn’t let it simply restart after a power outage. You have to manually press the power button to turn it on again. Luckily, we had a backup plan. We dusted off an electric roaster we bought on sale a while ago and hardly used. 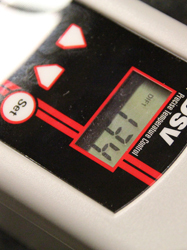 It was bigger, and simpler – we tested it – and it worked with the controller perfectly! 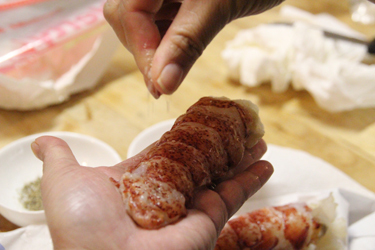 Next, to prep the lobster. 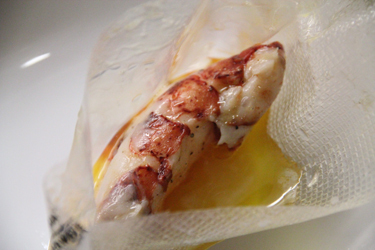 I de-shelled the tails and seasoned them, and then put them each in their own bags, with a pat of butter. Then, they got vacu-sealed. Awesome. 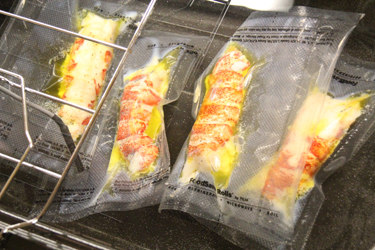 We’ve had our vacuum sealer for years and hadn’t been using it either – we were so excited to have such a cool use for it now. Into the sous vide rigged bath they go! We set the timer for 20 minutes – the recipe above was for larger tails, so we didn’t need to cook these ones as long. After the time was up, I went to retrieve our prizes. Voilà! 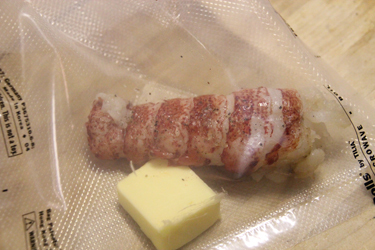 Sous Vide Butter Poached Lobster. I really had a great time cooking this way. Even though it might seem like a complicated setup, I liked the fact that we didn’t have to wait on the food or worry about it overcooking. While we wouldn’t want to cook all our food sous vide, it is definitely a great way to do small roasts or delicate foods. And I’m SO glad our crockpot didn’t work for this – using the roaster oven is way better – it’s going to allow us a lot more room. I can’t wait to use this again! 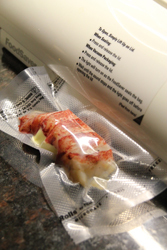 I just had my sample bag of lobster goodness for lunch – perfect! I will gladly volunteer for other tastings.